​CHECK ME OUT, I FLOAT! The Shadnasty from Xcite Baits is redefining the paddle-tail swimbait market. At 4” long, it is the perfect choice for a swim jig, spinnerbait, chatterbait trailer, an Alabama rig, or fished alone on a weighted hook or underspin. With its meaty main body and tapered tail, you don’t have to sacrifice durability for the necessary kicking action from a swimbait. The ribbed design running the entirety of the bait adds to the vibration and sound produced while swimming. We put recessed eye sockets in this bait for the easy addition of aftermarket eyes in the correct placement. 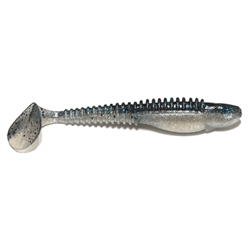 Poured without salt, the bones of this bait are durable yet enticing to multiple species. 6 baits per pack.